After a violent arrest was caught on camera in Wildwood, police have released body camera footage of the entire ordeal. Now, the Wildwood Mayor is speaking out. 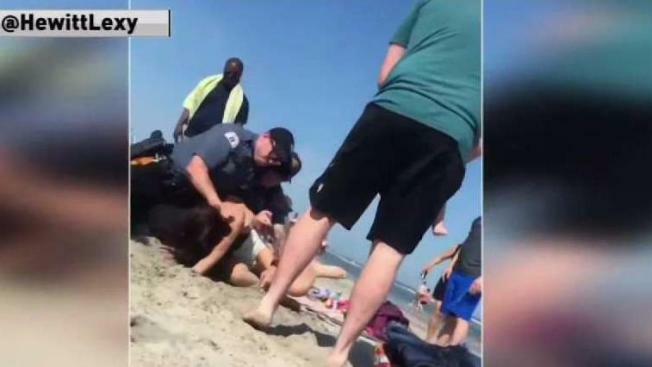 Police have released body camera video footage showing the violent arrest of a Philadelphia woman accused of underage drinking in Wildwood, New Jersey, over the Memorial Day weekend. Emily Weinman, 20, was arrested Saturday and charged with aggravated assault on a police officer, aggravated assault by spitting bodily fluids at/on a police officer, disorderly conduct, resisting arrest, obstruction and minor in possession of alcohol. A video of the arrest posted on social media shows three officers holding Weinman down on the sand. One officer punches her on the back of the head as they restrain her. Police identified the officers involved as Thomas Cannon, John Hillman and Robert Jordan. Wildwood Commissioner of Public Safety Tony Leonetti told NBC10 Weinman assaulted one of the officers first by kicking him in the groin and then running away, which the video does not show. In the first body camera video released Wednesday, an officer approaches Weinman and a friend and confronts them about underage drinking. The officer asks both women to take a breathalyzer. Weinman argues that she did not drink and the alcohol belongs to her aunt, adding that "[the test] didn't come out positive." The officer asks Weinman about her aunt's whereabouts, and then is heard telling the other officer that he is going to have the women pour the alcohol out. The video then cuts off. The second video begins with Weinman telling the officer it's not illegal to carry a closed container of alcohol. She argues that the alcohol isn't opened, but one of the officers tell her that because the bottle is visible, she can be charged for an "open display." The officer again asks Weinman where her aunt is. Weinman tells him she's on her way. When Weinman refuses to give the officer her last name, the situation escalates. "Okay, that's it. I'm done with you," the officer said. He cannot be heard asking his colleague for handcuffs. "Don't f---ing cuff me," Weinman tells the officer. "You're about to get dropped," he responds. As the officer approaches her, Weinman puts her hands up and appears to touch the camera. The video then turns off. Police say Weinman forcibly struck the officer in the torso where the body camera was mounted and caused the camera to turn off. The third video begins with the officer grabbing Weinman's hair and forcing her to the ground as she screams, struggles, curses and tells him repeatedly to get off of her. At one point a fist is seen hitting Weinman three times. "You're not allowed to beat me like that," she yells. "I'm a woman. It doesn't matter...You're not allowed to hit me and choke me like that!" She continued, "My daughter is right there seeing this! I didn't do anything wrong!" As an officer places handcuffs on Weinman, she can be seen in the video spitting at him. The video ends with one of the officers reporting the incident to another officer. The officer claims Weinman tried kicking another officer so he "slammed her on the ground." "She kicked him and I just hit her a couple times," the officer says. "And I put her in cuffs and locked her up." Weinman's attorney Stephen Dicht told NBC10 that after seeing the new body camera footage, his view hasn't changed. "My perception is the same," Dicht said. "My reaction is the same. It's an overreaction to the situation and an excessive use of force." The initial video sparked debate on social media, with some supporting the officers’ actions, others insisting that people wait for the entire story to emerge before passing judgment and others condemning what they believe to be excessive force from the officers. "If you refuse to give your name, than does that give them the right to pound you in the head?" Dicht asked. Wildwood Police say an internal affairs investigation was immediately initiated on the incident and the three officers were reassigned to administrative duty pending the outcome. "Chief Regalbuto stated that while he finds this video to be alarming, he does not want to rush to any judgment until having the final results of the investigation,” a Wildwood police spokesman wrote in a statement to NBC10. The Cape May County Prosecutor's Office would not comment on the incident outside of saying it's under review. Her attorney told NBC10 she is currently on probation for a previous simple assault charge in Philadelphia, her attorney said.